Feeling couped up in the city? Heat of the summer getting to you? Dreaming of dipping your toes into a refreshing lake? Splashing around in the sun? The answer is near! 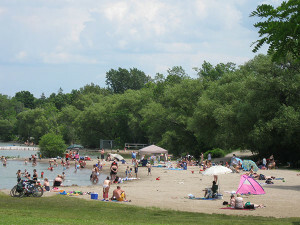 Come visit De La Salle Park Beach on Lake Simcoe. Lake Simcoe is a beautiful lake less than an hour north of Toronto. Zip up to the lake in the blink of an eye – without all the cottage country traffic. Amenities include, 1 full size and 2 junior size soccer fields, picnic tables, picnic shelter, drinking water, washrooms, playground, swimming, parking, and beach volleyball.